We left the house with our bread dough, our worms, the blessed fishing rod (an old stick covered with silver lichen), my camera, some sunscreen, a towel and determination to catch a fish. At the tracks, we pass by a massive CPR truck idling, maybe waiting for something else to come down the tracks. Michael tells the driver we are going fishing. The driver replies that he has seen the fish jumping. When we ask how big they are, the man shows us about 6 inches in length. This is a bit disappointing. As soon as we get to the dock, Michael takes the rod from my bag, does a few preliminary swings of the line and as it swings around it gets caught between the first two boards of the dock. 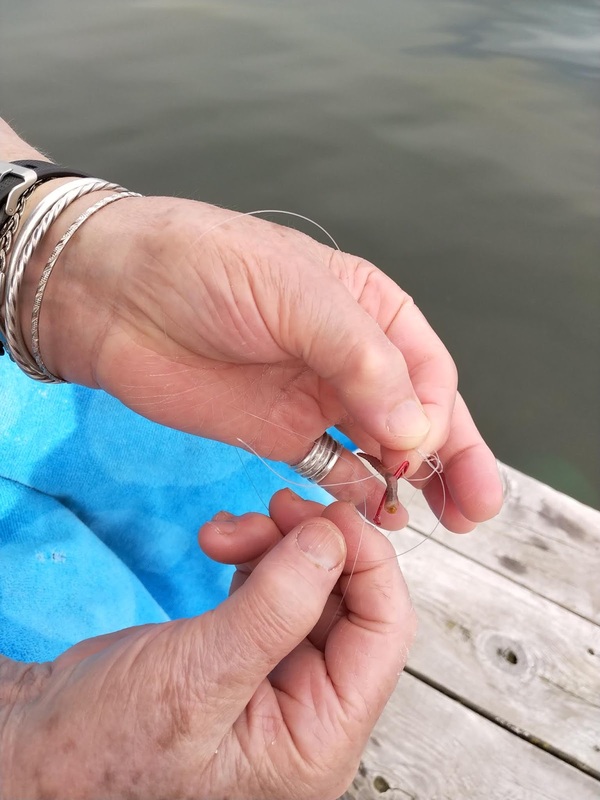 I tried to pull it out, but I find out that fishing line is as strong as dental floss. I cannot break the line. Michael takes a try. He breaks the line. I look at his face for I think he is going to cry. He looks for a cut on his hand but there is none. Still, the real pain on his face lingers. All I can do is keep my elbows tight beside my body and swing my arms out as though silently question, what next? We decide we will have to walk back up to the house to get another snell. Snell is the newest fishing word in our vocabulary: baitline snell. We got the word off of the package of hooks we are using. I didn’t know how to get the fishing line prepared last night. Glen dropped by looking for the paddle for the paddle board. Since he was at the door, he showed us how to add a weight to our fishing line. As well he showed us an appropriate hook for our fishing level. 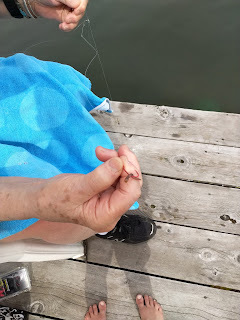 Thirdly, he showed us how to connect the hook to the line with a granny knot. This is a lot of information. Three pieces is about all I can hold at a time anymore. I am at a 9/10 full of gratitude to him, for now I don’t have to take a course to learn this, nor search the Internet, winnowing out ads and useless bits of trivia along the way. And now I find myself back up at the house with Michael. 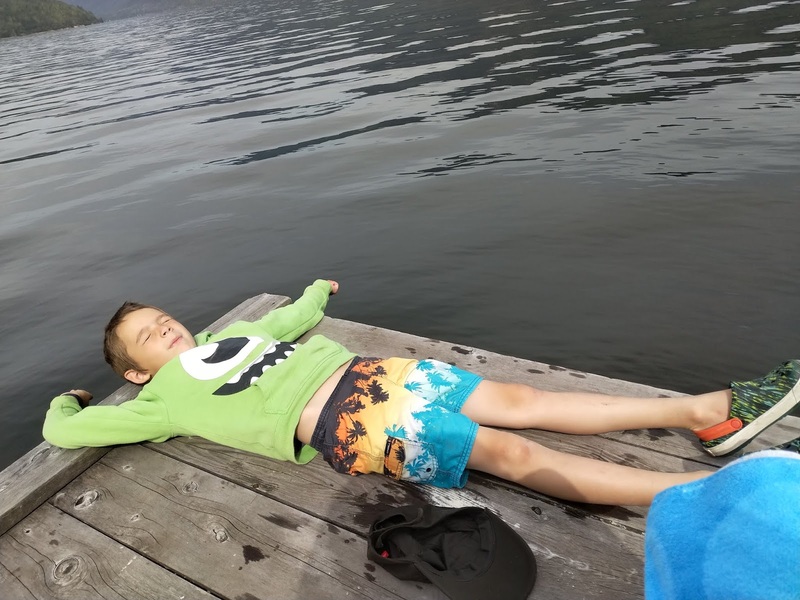 We decide to quietly go in and out of the garage and get back to the water, since any sign that we are going fishing will be caught up by the girls, and we aren’t ready to have fellow-travellers with us today. What does dangling mean?, he asks. Back at the water I am pleased when I can remember how to apply the granny-knot and get a new snell added to the line. As he takes it from me, Michael’s hand brushes by the snell and he leaps back, a new look of shock on his face. He is holding his finger as though there might be blood coming soon. I look. No blood but a nice slice to the skin. Now we look at the hook with new admiration. We even draw it on my day book. Not only does it have a point at the end, but there are three other points that will grab onto the fish should it bite the bait. Also dangerous to the human hand when it brushes by. Michael puts the bait on the hook. He is nervous now. He gently drapes the worm into the crevice of the hook. I know the worm is going to wash right out of there once it hits the water, so I take it on my lap. He wants to hold the worm for a minute. 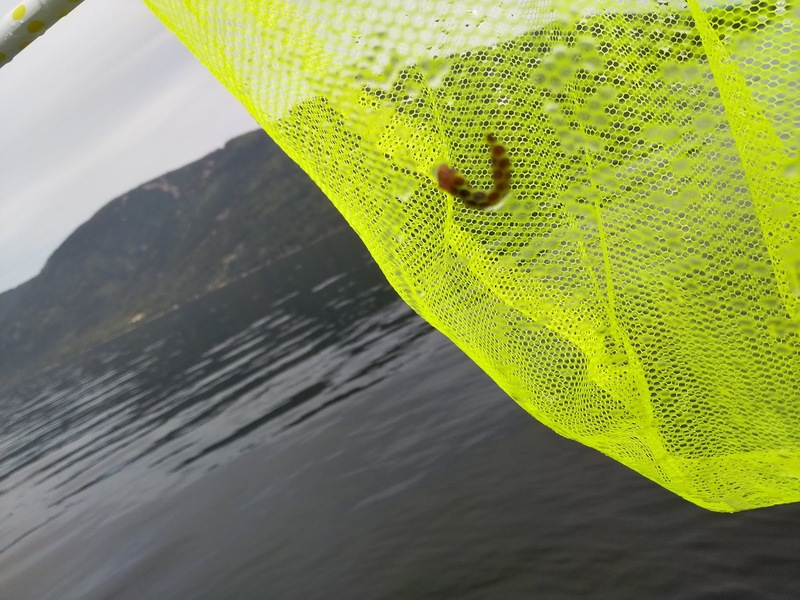 Now he swings it around in his net in the water and when it comes out, the worm is stuck between the outside and inside of the net. To disengage it from the net, we end up with two worms. I know we will have to do this because I saw my dad do it once. Michael is in shock again. There is no way we are hitting a fish once it is caught. At least in his mind. We are going to keep pouring water over it so it won’t die. I am not going to argue. Neither am I going to keep pouring water over a fish. In fact, we aren’t going to catch a fish. 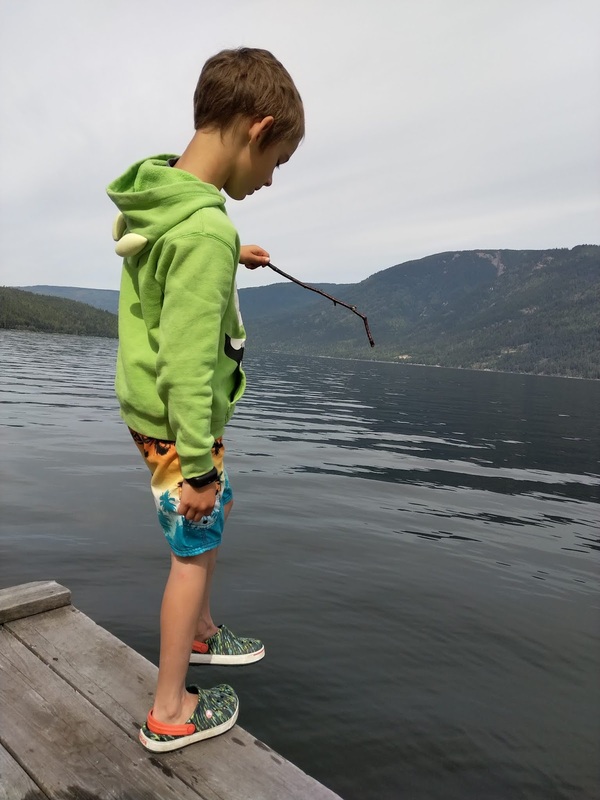 We have a stick from the property, a little bit of fishing line and great hope. That is all. Fishing takes a long time. He asks what we can do since he is bored with the waiting. 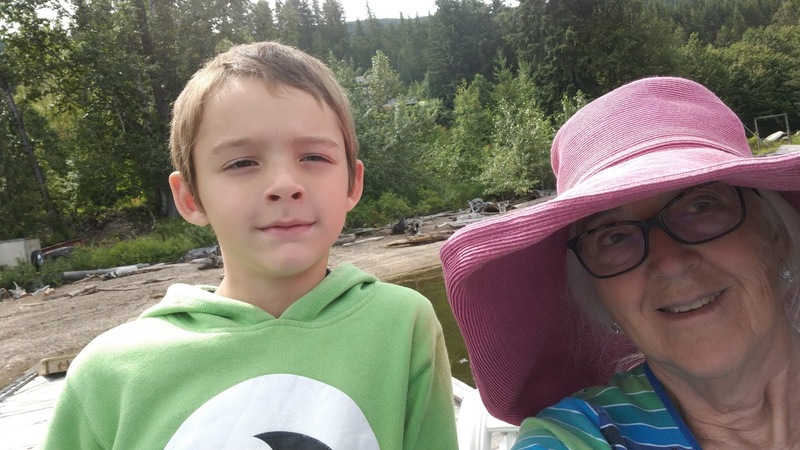 We discuss the dragonflies that are copulating over the water. He doesn’t know words like this. That is fine with me. Occasionally a seagull swoops across in front of us, flying low across the water, then landing and tucking its wings to its side. As we talk the fishing line comes out of the water many times. The worm is now washed clean. No dirt remains on it. It wiggles still. Back in the water it goes. “Ah, so cute,” he says, “ pointing in another direction. When he says this the second time with even more love, I look. A duck with seven ducklings swimming behind her, no room between any of them, as though they are afraid they might get lost. They swim toward shore, past the blue dock. He wants to run after them, so I tell him I will hold the fishing rod while he runs down the shore to see where they land. I put the rod in my lap and begin to delete pictures from my phone. I can feel the rod hit my hands as though someone has ripped it away from me. Through my fingers it goes and I can see it in the air for a split second. I look out to try to find it. This is the first time I have been close to tears in years. I think there are one million bits of water behind my eye sockets, but what is the use of spilling them now. I yell to Michael, as though he can do something a fishing rod gone AWOL. When he runs back and sees that the rod is gone, his disappointment is even greater than mine. “What are we going to tell everyone? No one is going to believe us”, I say. I have to explain that all fishermen lie about the one that got away. At least most fishermen. Then he begins to wonder if I threw the rod out on purpose, for now we can see it floating in the water about 5 canoe lengths away. I try to get him to swim after it, but he is pretty sure he will drown. It is about noon – time to go up to the house. All the way up the road, I hear a lecture about responsibility when holding a fishing rod. I don’t know which parent tape I am listening to but it is a strong one, which I don’t think needs much more reinforcement. I stop to pick a few thimble berries for I didn’t have breakfast. He tells me he doesn’t like them. Then he sees some fire cherries and pulls down a limb so that he can eat them. He is hungry too. I tell him that I will make one of the thimbleberry baskets for him to use as a cup. Then we can pick more. He is interested in this, so I take a large thimble berry leaf, twist the 2 bottom lobes over each other and thread the stem up through the two leaves, making a perfect cone shape. Then we stand by the tree, me holding down the limbs and him, filling the cone with cherries. 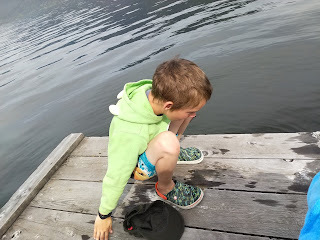 Previously, I promised him that we could fish morning and evening, but this evening I have had to start again: find a tree branch, get some fishing line, a weight, and a snell. Miranda helps me. She is much better at tying these knots than I am.